This is the story about a little 4 year old boy. 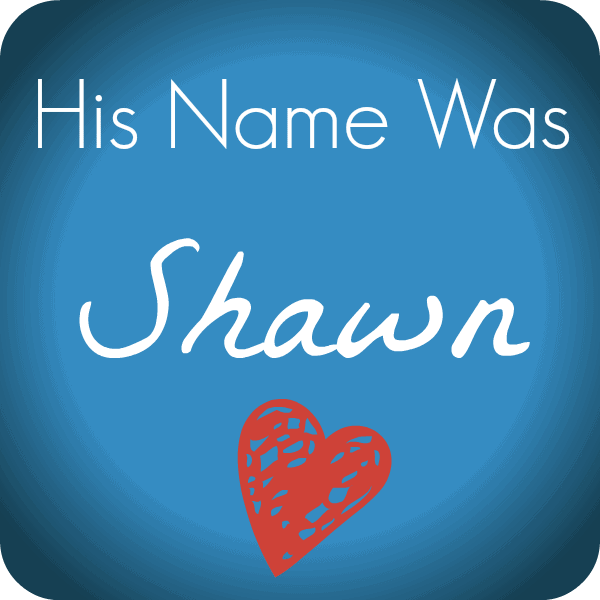 His name was Shawn. But first, here’s a little background on how we got involved in this story. Back in August 2013, while I was away on vacation in beautiful Deep Creek Lake, Maryland, Terri called me with an opportunity. This opportunity was a once-in-a-lifetime, check-it-off-your-bucket-list, type of opportunity. 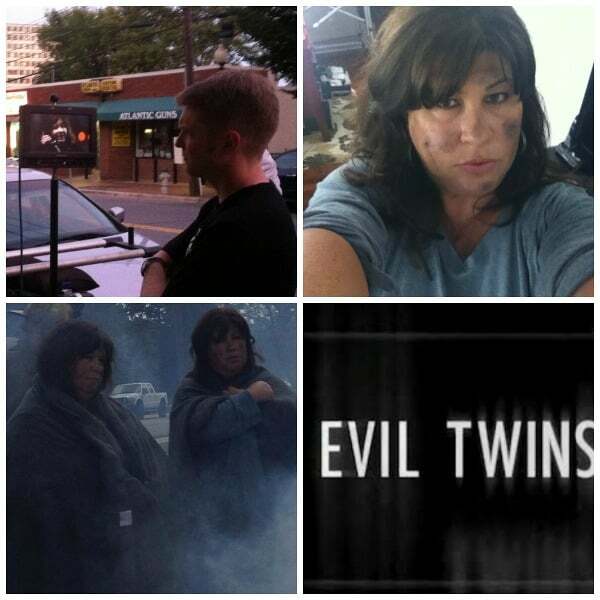 We were asked by a local production company, Sirens Media, to audition for a starring role in an episode of Investigation Discovery’s Evil Twins. But neither of us has ever acted before in our lives. Terri’s son has been acting in theater since he was 6 years old. Somehow, through the grapevine, Sirens Media found us. Of course I screamed at the top of my lungs and thought, how exciting will this be! Turns out we nailed the audition and were offered the roles. Obviously, Terri and I were both so excited! BUT we were also somewhat apprehensive. Because as the name of the show implies, it involves twins who are evil. It’s a true-crime series of twins who commit evil acts. Like, against-the law evil acts. Of course that scared us. We in no way wanted to glorify a true crime. The story that we acted out is a horrific, tragic story that was heart-wrenching to learn about, let alone act it out. The shooting was for the duration of one week and took place at several locations in Silver Spring, Maryland. In order to more closely resemble the real-life twins, Gretchen Graham and Gloria Franklin, Terri and I were asked to color our hair dark. 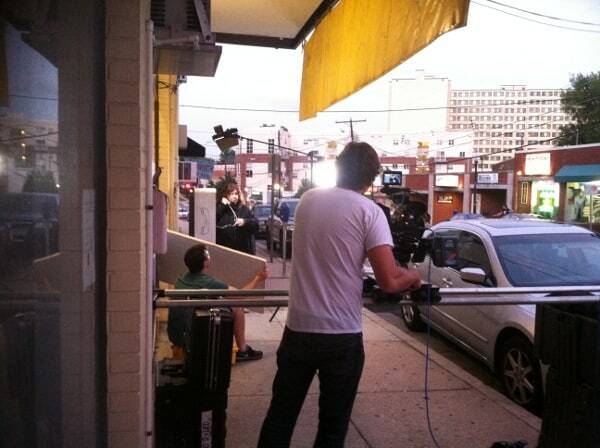 On the first day of shooting, we met at the Tastee Diner in Silver Spring, Maryland. Terri and I both played waitresses. 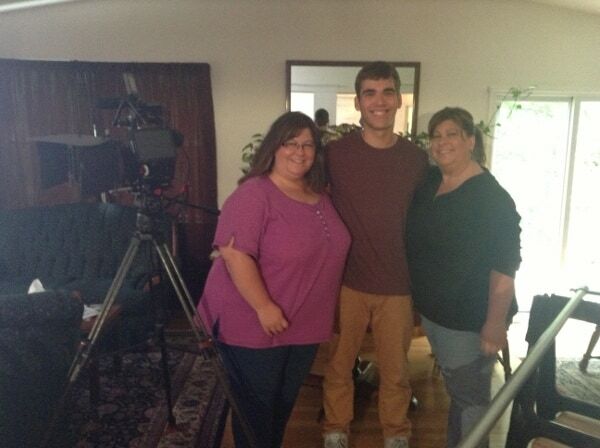 It was so surreal to be in front of the cameras and production crew, feeling like real actors. But the shooting days were long and tiring. It’s truly not as glamorous as you might imagine. But it was an experience that both of us knew would most likely never happen again in our lifetimes. The actual, real-life story happened in 1989 in Wolverine Lake, Michigan in the winter. However, we filmed it in 90 degree temperatures. At times it was pretty brutal, wearing heavy coats, being blasted with smoke, pretending to be cold, when in reality we were sweating profusely. The above picture is Terri and me with one of the actors who played my son. The below picture is Terri and me holding our little star who played Terri’s son. 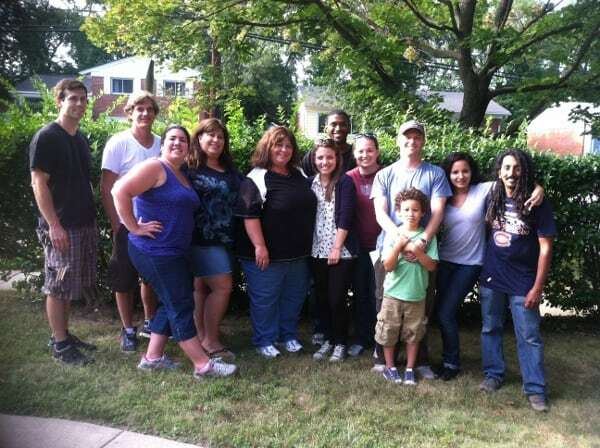 The picture below is most of the crew on our final day of shooting. Some of the most hard-working and nicest people I’ve ever come to know. If you’re interested in watching our episode, you can find it on Amazon: Evil Twins: Sacrificial Lamb. There’s also information about the case we acted out, as well as other twin related crimes in this book, Evil Twins: Chilling True Stories of Twins, Killing and Insanity. So, normally I would end this post and say how much fun we had! Don’t get me wrong, we did have fun! Friendships were made in that one week of shooting that we still have today. We all worked extremely hard in hopes that it will be a great episode. But my main purpose of this post wasn’t to show you how fun it is to be an actor on a nationally televised show. The story that we acted out was about a set of twins whose lives went in totally different directions. One twin’s life was pretty normal and the other twin’s life was very chaotic. The chaos resulted in an unplanned pregnancy and the birth of a little boy. Shawn was born into a life that nobody would want to be born into. His mother didn’t know how to be a mom. Shawn was homeless at times. He was neglected and was many times left unsupervised. As a result, he acted out. Shawn wanted and desperately needed attention. To get this attention, he got a hold of lighters and lit things. His caretakers didn’t know how to handle him, so they would lock him in a room for long periods of time with a padlock on the outside of the door. Shawn couldn’t get out until they let him out. He was an abused, neglected child. On that fateful day back in 1989 when he died, Shawn was only 4 years old. If Shawn hadn’t died that day, he would now be 29 years old. I’ve searched countless hours online, trying to find more information about Shawn Graham. Are there any pictures of him? Where was he laid to rest? Did they have a proper funeral for him? Is there anything, anywhere that memorializes him? Shawn Graham was a child who deserved a better life, but never had a chance. I wish so badly that I could turn back the hands of time and get Shawn out of the situation that he was in. I’d give anything to be able to offer him a huge hug and tell him everything is going to be okay. How many other Shawn Graham’s are there out there? My fear is that there are many. I recently found statistics online about child abuse and neglect. It’s a national epidemic and something that is in desperate need of more awareness. Did you know that the month of April is National Child Abuse Prevention Month? This site offers a downloadable resource guide, information on preventing child abuse, protecting children from the risk of abuse, and promoting healthy families. They also include widgets you can use on social media to show your support in promoting National Child Abuse Prevention Month. Information about national organizations who work to promote well-being in children, families, and communities, including contact information, is available on the Child Welfare Information Gateway. Terri and I, along with the entire cast and crew were forever affected by our episode of Evil Twins. It is the only episode that involves the death of a child. We all cried at some point, before, during, and after the taping of the show. It’s a terribly sad subject, but something that is real and happens every day. Our hope is that more people will educate themselves on the signs of child abuse, the resources that are available, and the ways to stop the endless cycle that child abuse presents. This post is in memory of little Shawn Graham. We never knew you, but we’re so sorry for what happened to you. And we will never forget you! What a beautifully written article. I know how hard the subject matter was on both of you and I’m so proud that you have turned it into a platform to raise awareness. Hugs girls! Thank you so much Pam!! You’ve been there for us throughout this entire thing. We’re so thankful for your friendship and support. It means so much to us. I’m proud to say I know you both; sad to have seen the tragic end to that little boys hard four years…. Thank you Amy! I know, it’s such an awful story. My heart aches for that little boy. I don’t even know what to say; I’m all chocked up. I’m so glad you and Terri made this movie because it lead to this post which will hopefully reach a lot of people who can make a difference. Thank you SO much Cheryl! We hope it makes even a little difference! My heart breaks for that little boy. Wow. They couldn’t have just said, as they were having that rational conversation in the middle of a burning house, “Let’s just open the door and save Shawn; we’ll figure the rest out later.” Geez. I’m sure the boy could be loved, guided, disciplined as necessary (as we all were as children) and grown up to be a fine young man. But thanks to those two sisters, we’ll never know. Thank you for participating in that project. Everyone did a great job. P.S. : I’ve been to Frederick and love your town. Beautiful place. Thank you so much for your words – it means so much to us that we could make an impact on this tragic issue! I just watched the episode & it brought tears to my eyes all I kept thinking about was Shawn may he RIP. They both should have gotten life with out the possiblllity of parole for taking that baby life. Awesome! 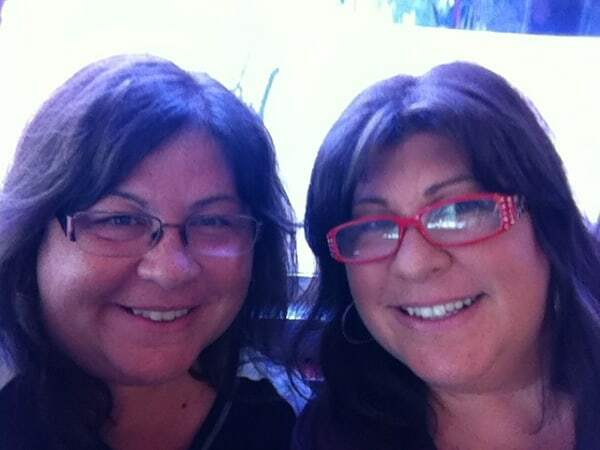 That’s what we were going for – in “real life” we don’t look as much alike! Hello! I am a twin from Baltimore City (my sister lives in Anne Arundel, myself in Palm Beach County, Fla) and I was so moved by you and your sister’s performance. And I am so moved that you have made this about poor Shawn and his lost potential and the adults who failed him. Now other Shawn’s have you to help beat the drum for him. Bless you. I just watched the episode of Evil Twins which told the story of Shawn Graham. It made me cry. I have a son who just turned 5 not long ago, and I can’t imagine anyone treating a child like that. Like you, I have searched for more information about this little boy – pictures, memorials – and the only thing I found was this page. I turned 30 not too long ago. He and I were born around the same time. It breaks my heart any time I read or hear of stories like this. Children are such precious gifts. There are so many people who want them and can’t have them. It’s a blessing to be a mother. If you realise you aren’t a mother, why not give your child to someone who wants to be one and can’t? Watching that story, I couldn’t help buy ask that. Why couldn’t the person who wanted him, keep him when his mother was obviously neglecting him? Where was someone who cared about that little boy? Thanks for writing this article and making Shawn’s story known. Wow!!! Very proud of my wife Terri and my sister-in-law Pam. You were both terrific. Very powerful performances. Very sad story and a great post to get the word out. Nice job girls. I just saw this episode last night. It is so sad. Poor Shawn never had a chance. Just think. There is a man out there who had a son that he had no clue existed and now the little boy is dead. I’m sure glad Terri and Pam aren’t evil like the twins they portrayed. Thanks John! It really made an impact on all of us. My name is Julie and the story about Gloria and Gretchen and my baby cousin Sean was untrue. I am angered and hurt that anyone could be profiting from such a tradgedy. My Aunt was not a prostitute she had been married twice and Janet was an abbusive woman who with her many children beat my Aunt and my cousin, when she finally had had enough my Aunt made a run for it with her son Sean, yes she did end up at a womans shelter in Pontiac and Pontiac is where my Mother, brother and I picked her up. My Mother and Aunt have two other sisters and a brother and their IQ was in low 60’s at the time of TRAIL not at school age they portray on the show, so you see, they were not “Evil” just children and if Sean was locked in his room why was he found in the bathroom? lots of holes in the story of being “Ture”. Did anyone question the family? No, no interviews with the family. Just Ret. Detctives trying to put their Names back in the spot light. Im very upset at what has happened to my mother and although she has passed noone has stepped in to protect her name and legacy until now. My cousin Sean’s death was a tragic accident that should have never happened, we lost our home, our family and was labled as “baby killers” I was only 10 at the time but I lived though it. No child should go though someting like that. As for my poor little cousin he had a funeral and was properly laid to rest in 1989, but I will not say where due to protection of privacy and that it is no ones business, no one has given any thought to the survivors and what they have been through, No one called to interview any one who actually lived through the events. Unfortunately, just so you all know, that show was not true. The twins in this case were both mentally retarded and almost died in the fire themselves. They had the tragedy of losing their son, their only boy and now have shows like this about them which are slanderous and not true. I was wondering why Sean was in a locked 8×7 room but the firemen found him in the bathtub. Sad story. I had wondered the same thing. As soon as they said he was found in the tub I was like, how if he was locked in the room? 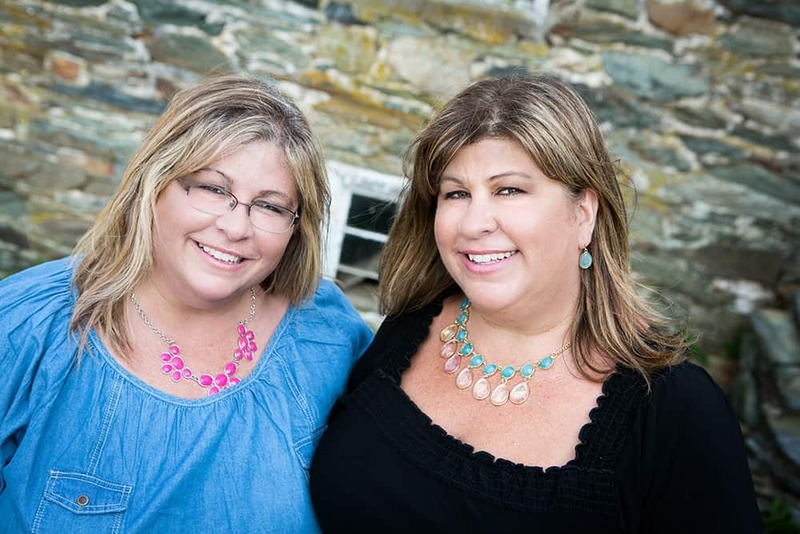 Julie, did anyone associated with the production company that made the program about your mom and aunt contact anyone in your family for your side? I ask because sometimes people involved in a tragedy such as this will not cooperate when contacted. What happened was that the authorities made the case, either rightly or wrongly that your aunt and mom were responsible for Sean”s death and that made it news. They were charged, tried and convicted. That was the basis of the program. I cannot believe that a responsiible production companyi would not make the effort to reach out to the family of the twins. So while I sympathize, stories like those involving your mom and aunt are going to be fodder for television whether or not your family tells their side. No one from the family was contacted and no one knew that the show was going to be aired until it aired the second time. We are all very upset by the program but no one wanted to know what the family had to say. Every one was just out to make money and hurt us more. I’m going to watch the episode in about an hour. I also try to do some research before watching the show. Putting the twins names really got me no where except to finally find out their names and poor Shawn s name the victim. Then it brought me here. Thanks for this site. And mighty big of you not to respond to family comments. Especially, the one coming from someone who was only ten at the time who probably got her info from that night from protective family. And if someone with a supposedly low IQ has some sort of free pass that’s ridiculous. I have so much more I could say on this subject but I really don’t want to get into it with protective family members. I thought u guys did a great job! I watch evil twins all the time, but this one hit my heart. I told the story to my husband and 11 year old son. Now they want to see the episode so I will have to keep my eyes open for the next time it plays. My son was outraged about the time they received. He said they both should have gotten death! Anyways great job with the story. Keep us posted if u ever find out a picture of Shawn or even a memorial. @julie and @the grieving family. ..first I would like to say if it was not true why did the twins confess and blamed it on each other and iam a very big fan of id discovery and they would not show something that is not true and second if she did not want the baby because he was of mixed race there were plenty of places to take him or gave him up for adoption anything but kill him smh and from the story it seems that the family did like the fact that he was of mixed race and to the ladies who did the story u all did a wonderful job putting your feelings aside for the greater good god bless you ladies and to the family u want to comment now after its all said and done but if u all cared about that baby u should have step in to make sure he was not going to be abused any more so to everyone who knew about the abuse and did nothing u all are to blame to only if someone had just stepped up and put there own prejudices aside and thought of him as a child a innocent baby a human being unable to fend for himself and not as a horrible mixed race child he would be alive today and for all people involved how can u all sleep at night knowing u could have saved a innocent babys life and another thing u say they were mentally retarded then she should have never been able to keep that child so I do not believe that they were mentally retarded I just want to say god bless little sean sorry u did not get a chance at life and sorry u were born to such a horrible mother but u will get your justice in do time may god bless u and I hope that u are at peace with god u will stay in the hearts of many Aman. ..
Let me start by saying that you did a wonderful job on the show and your blog is amazing…I’m always looking for new blogs with great ideas to follow…. Good Job Ladies!!! Let’s just say I am a finally VERY HAPPY “no longer” member of this family… I have no love loss for the Franklin’s… And was childishly excited to watch this episode when several people called me to tell me it was on…. after turning it off I laughed it up with all my friends, said a secret prayer for that little boy and went to bed… but the truth has been nagging at me and when I saw Gloria’s oldest son the other day and he said “I heard you saw the show” and I embarrassingly said yes, the sad look in his eyes and following “You know that wasn’t true about my mom” haunts me as I write this. What happened that day was a tragedy. From what I have pieced together Gloria never ever wanted to leave him in that house and was very confused and just listened to Gretchen tell her no to get out. There was no crazy turn on each other confessions. There were two mentally retarded confused women one who didn’t want her little boy anymore and one who wanted to see her kids. There was an argument in the house. It wasn’t a hushed secret lets let this boy die conversation…it was Gloria demanding to get him and Gretchen telling her she could die and never see her own kids again…. that is all that Gloria would ever need to hear …. I honestly think Don should have been tried…. Whatever your opinion….Gloria was released from prison. I was there that day she finally hugged her kids on the other side of that fence. I was there the day her son picked her up and swung her around and told her he would take care of her forever. I have been there and watched her copy books word for word into notebooks because she was ” learning” and she was going to make her son proud and get a job and help him for once. I was there when her son picked her up and took her grocery shopping every week and she road on the back of the cart and laughed….. I originally thought Gloria was a murderer… Gloria was not a murderer… She was an innocent sweet woman who got on my nerves….. I was there the day Gloria wasn’t feeling and well and her son took her to the hospital. I was there when she had a stroke and just kept watching as she pet her children and told them what good care they took of her… she had no idea everyone was there because she was going to die. I grieved for her. It surprised me. I grieve for Shawn. I grieve for the Gloria’s son and daughter. My heart broke to see how pained her son was over this episode. My tears wouldn’t stop after I read Julie’s comment above and the subsequent bashing of a stranger… they have obviously never met the tough as nails Julie…. I owe nothing to these people but I could not stand by and say nothing after reading this. I wish Discovery would do a real story on her…. a real story on the mother who was the child and the children that raised her…. Thank you for your comment. Our hearts break for everybody involved. 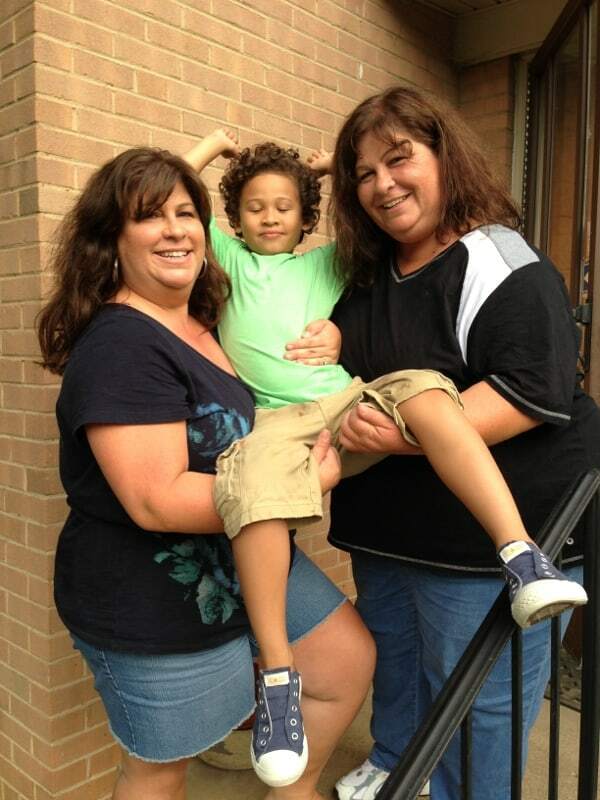 That’s great that retarded woman who let a little defenseless boy die get out of jail to see her kids and embrace them. Too bad little Shawn couldn’t have been embraced and loved> i have no sympathy and if these two “mothers’ Were so mentally incompetent to let a small child die , they should have stayed locked up! Thank you so much for reading! It was quite the experience for us – God bless Shawn. I caught this episode last night and was immediately sucked in due to the fact that I’m a Michigander and I don’t live far from Wolverine Lake. I frequently watch ID due to my interests in crime and psychology. I have often pondered how true these re-enactments actually are. Don’t producers have to get permission from the family to air these types of shows? I’ve always been curious. Regardless, an innocent life was still taken much too soon, and for that my heart breaks. Congrats on the performance, I saw the twins look very evil, true or false, its obvious that boy need it attention, love, that his mother did not have. I was very sad for the end his life had he may rip. Just watched your evil twin episode in crime investigation channel. What a tragic story! Thanks for your role. I found your story because I am watching the episode right now. It prompted me, like you, to learn more about Shawn. I am a foster parent and unfortunately we do see things like this a lot. It is truly heartbreaking. I commend you and your sis for bringing his little life to light. I watched ID. You all did a wonderful job.no child should suffer I hope that I am able to change any child suffering in this world.that’s my prayer.thank you.I cried for the child. The abuse. God have mercy.he’s n heaven. No matter what the true story is, the little boy who portrayed Shawn just broke my heart. Once I figured out where the story was going, I broke down. To the point my dog was nudging my arm trying to comfort me. Now my 5 yr old son will be home from school soon and I plan on giving him the biggest hug ever. Even if this particular episode had false information, things like this DO happen and I pray for those children. It looks like a lot of the ID story came from this book, Evil Twins. Scroll up to page 109. Yeah – I would guess that this book is one of the resources of info for the show! Thanks for you comment! From what we understand, they both got released from prison after only about 7 years. Gloria has since died (we’re not sure how she died) and Gretchen is still alive. Aw! Thank you  This is Terri – my sister Pam wrote the post, and I actually just read it again and cried all over again. We will never forget our experience or this story. Just finished watching the evil twins episode and what a great job you two ladies did! It made me cry to find out that little Shawn’s mom would be so evil to let her flesh and blood suffer like that and just let him die. As for the family I really do hope that Gloria really didn’t want him to die and if she was innocent I feel bad she got robbed years of her life with her family. May you both RIP Shawn and Gloria! Such a tough story but so glad you and your sister helped to get the story out there. Maybe somehow, someway it saved some other little Shawn. We really hope so Wendy. Thanks so much for reading our post and your kind words. Hi, I’ve literally just watched this on CI in the UK, and I am in absolute shock that them sisters could do that to a young defenceless boy, especially the mother, it’s sickening, as I was thinking of my 4yr old son all the way through it. What I dont understand is how they had a light sentence for an indescribable crime, they should of locked them up and thrown away the key. By the way ladies you played the part brilliantly, as well as the little boy that played Shawn. Wow…in a way, this is truly a sad case where God’s child was taken when it wasn’t meant to be taken. I was 11 years old when Shawn came into the world, and at 15, a freshman in high school when he soley left this world at 4. I remember seeing the crime on t.v., wishing for someone get him out of there, but again, we all were. Shawn’s mother should have better job of raising him. I would love to see any pics of him, the real Shawn, and I, too, would give him a HUGE hug. May you always be in our hearts, Shawn R.I.P. Just watched the episode. Had no idea it was filmed in MD! Thank you for posting a tribute to sweet precious angel Shawn. what a sad sad story. Truly evil women! What get me upset .. Is that his mother is out there living herife freely … And Shawn is just a memory to her .. When she should be tormented just like Shawn was !!! Thank you so much for your heartfelt comments!!! Sorry, I posted so short…I never knew him, but I love him!!! He’s God’s child now…Rip Sean love you and see you in Heaven…. Thank you. Very touching episode. Our family were all watching and made all of us sad. Thank you for the story. We now have another to pray for everyday. Thanks ladies great performance. Thank You for speaking out for those whom where silenced by another’s choice. I’m watching this episode of “Evil Twins” right now and an effort to find more information led me here. Thank you for this lovely article. What a heart-breaking story. Pam, you and Terri were incredible as the sisters, and I would never have known it was your first time acting. Wow! Thank you so much Donna! That is such a nice compliment! Yes – SUCH a sad story  We wanted to somehow do something good about it by writing the post and bringing more awareness to this terrible issue. I knew Shawn. This little boy and his mother were taken in by a nasty family who got some kind of kickback from social services to take them. I was a very young child myself, watching various members of that family beat Shawn while calling him ni**er. Eventually Gretchen and Shawn moved out and soon after Shawn died. He was found in a bathtub indicating he was incapacitated before the fire started. While living in that previous house, screams of abuse and hate were never ending, regardless, he was always smiling and happy. The monster that took them in had a husband, boyfriend and 4 kids of her own living in that place, ALL took turns hurting Shawn. The evil of the whole situation will haunt me forever. Such a terrible, terrible tragedy  May Shawn rest in peace. Thank you for your comment Ryan. Rest in Peace to little Shawn.. So many things in his life were stacked against him that no matter what the truth really is he never had a chance. From reading all the comments it seems the ID channel runs this episode about every six months… May Shawn never be forgotten. We agree Cortney. So tragic. You guys were so good! I hated y’all. Lol but seriously what a horrific crime. Are those 2 still in prison? Do you know? Thank you Susan! I know, they were very tough roles to play and it’s such a terrible story. One twin is out of jail and the other one passed away. I read the book Evil Twins by John Glatt and was looking for info on Gloria and Gretchen, and came across this website. I did find Shawn’s Find a Grave page, and he does have a stone (although it only has the month and year for dob and death, not the days), and it is engraved “Our Baby” which doesn’t sound much like Gretchen had anything to do with it. I’m quite sure both Gloria and Donald Franklin, and Gretchen Graham, knew right from wrong, and that it was WRONG to lock this little boy up, and treat him differently from the Franklin children. Gloria had been raising three children of her own apparently just fine, and she knew what was being done to Shawn was wrong. Despite her supposedly low IQ, she took care of three kids, a house, and had a job. It makes no sense to say that Gretchen forced her into leaving Shawn in a burning house and her own cat Fluffy too, by saying if she didn’t, she would never see her three kids again. Even an idiot wouldn’t fall for that. She should have wanted to save her own cat at least! They are both murderers, of a child and a cat. They both knew darn well they could have saved them, without danger to themselves because they were there when the fire began. They didn’t even bother unbolting his door so he would have a chance! They made sure to leave it bolted because their lives would be easier without them. So sacrifice the cat too and scar your child Julie for life finding the cat’s remains. They are both KILLERS. Interesting to know that Gloria died (although not WHEN), but what is Gretchen doing? Hi Tawny, We don’t know what Gretchen is doing now. The whole story is just so sad. Thanks for your reply. Didn’t know about the cat. I just watched the episode, and I felt bad. Well, although Shawn played with the lighter (causing his demise) I could not believe that his mother Gretchen and auntie Gloria thought of themselves. How horrid! But I what I know about Gretchen and Gloria is that they were released in 1996, but Gloria died in 2011. Gretchen’s whereabouts are unknown. I feel bad for Shawn. I just saw this episode of Evil Twins. I actually had to change the channel because I couldn’t watch the actual fire reenactment. You and your sister did a great job, and you aren’t even professional actors?! Child abuse of any for is wrong. Without the murder and circumstances around it, he was locked in a room? Neglected? And died due to that abuse and neglect. Those are facts, no matter who did or didn’t do something, or who was a good or bad person. Good people do bad things, Bad people do good things, it doesn’t change thd details of Seans life or death. I hope what the family members on here are saying is true, and Sean did experience some love in his short lifetime. Rather than be defensive, notice the resources for fighting child abuse referenced in this article and get involved. Service is how a difference is made. I am praying for the family and for Sean as well. There is NO excuse for treating a child that way, or leaving a child to suffocate (in the bathroom, bedroom wherever). Owning the reality of experiences is how we move on, and where healing takes place. This blog entry was written very well, thank you for taking the time to write it, and remind people who the true victim was in this story. Thank you for your kind words Estelle. It’s a terrible story that Terri & I will never forget and we’ll never forget poor Shawn. We wish we could’ve met him and saved him from this terrible tragedy. Thank you for posting this. It was a very interesting read. Child abuse is such a horrific thing and so very preventable. I have had to report one of my own family members for neglect and abuse. The children are now out of that home and living with an angel who has now adopted them and some of my family and myself are still in their lives. I hate to think about what would have happened to them if they had stayed with her. I wish more people would get involved!! No, I’m not patting myself on the back but I do count reporting her as one of the best things I ever did. If you ever think that something bad is happening to a child/children then please make that call…it could save their lives!!! RIP Shawn. You are free to fly in Heaven with no reason to ever be scared again!! So glad there are people like you in this world who do their part to ensure a child’s safety! Thank you! Sou Rita, moro em Goiânia, no Brasil. Triste história, porém, muito claramente encenada por vocês. Fico triste em saber que muitas pessoas viam o menino naquela situação e nada fizeram. Muitas coisas ruins acontecem por acharmos que o problema do vizinho não é problema nosso. Muitas coisas poderiam ter sido feitas antes deste fim trágico. Todavia, parabenizo vocês pelo grande trabalho que fizeram. Um abraço!